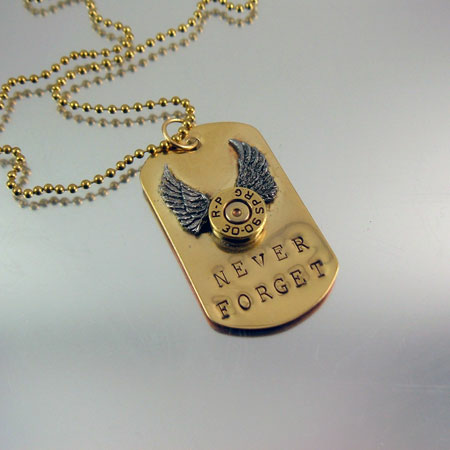 Custom Memorial Bullet Dog Tag. 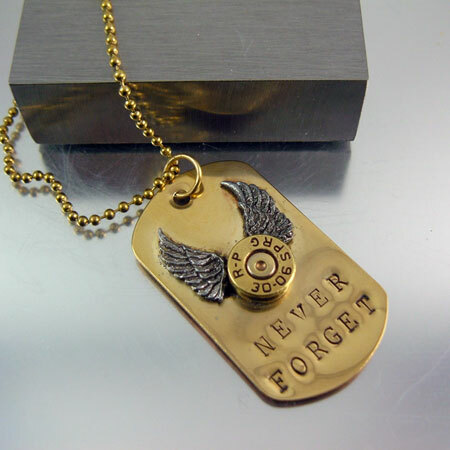 This brass dog tag can be stamped with a date or a name or made as shown with your memorial bullet casing. You may consider just an initial and last name along with a date. As long as it can fit it can be done. The bullet casing you send me will be cut and attached to the dog tag, your choice of including wings or not. 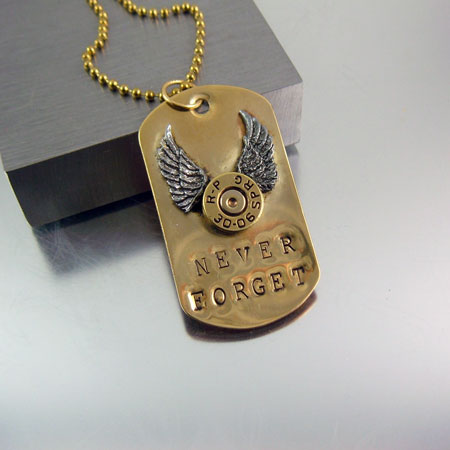 The memorial bullet casing you saved can now become a piece of jewelry to wear or display as a memorial to your loved one. This design is suitable for any military, armed forces, Sheriff, Police Department, Special Forces or someone deserving a special and personalized custom memorial piece. The individual piece displayed is available at the price shown. Your custom work begins at this price and the final price will depend on what you�d like done. You will own a one-of-a-kind, customized item which no one else in this world will have. All images, ideas and concepts found on this web site and/or galleries and pages are the intellectual property of the artist Julie Teeples, who created them and are protected by the fullest extent of copyright law.